Aprilia Aprilia - Spring Days Specials Promotion Details | Available at BMG Powersports, Inc.
We are starting the new year off right with some amazing offers! Take advantage of fantastic finance opportunities as low as 1.99% APR for 36 months1 or up to $1,250 Customer Cash3 on select MY18 models. 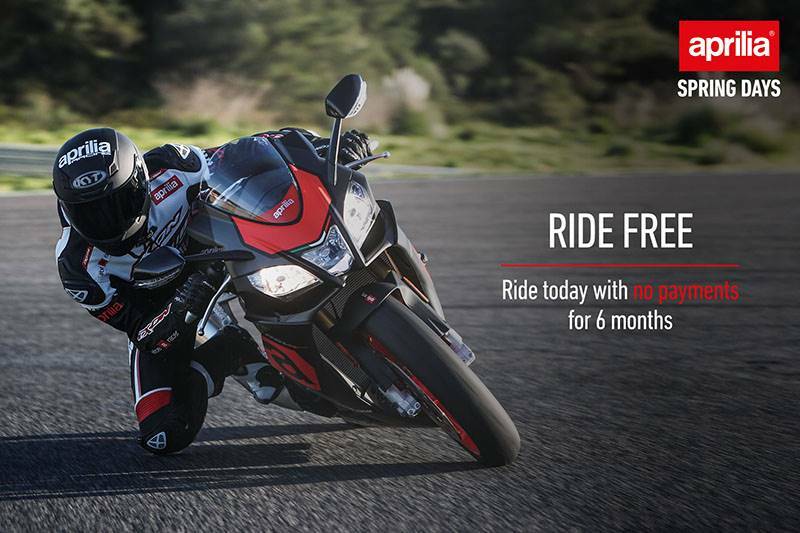 With payments starting as low as $156/mo2, there's no better time than now to get the new Aprilia of your dreams. Head over to your local Aprilia dealer today and you can be hitting the backroads or track in no time! (5) Customer cash on the following select vehicles: $1,250 off MSRP on the following vehicles; RSV4 RF LE MY18 and RSV4 RF MY18 and prior; $750 off MSRP on the following vehicles; RSV4 RR MY18 and prior, Tuono RF MY18 and prior, Tuono RR MY18 and prior, Dorsoduro 900 MY18 and prior and Shiver 900 MY18 and prior. See dealer for product eligibility and qualifications between 04/01/2019 and 05/31/2019.